Run queries from a Java application that communicates with the Presto service on your cluster through the Presto Java JDBC driver. Prepare data. This tutorial uses the Chicago Taxi Trips public dataset, available in BigQuery. Use the Pricing Calculator to generate a cost estimate based on your projected usage. New Google Cloud Platform users may be eligible for a free trial. If you haven't already done so, create a Google Cloud Platform project and a Cloud Storage bucket to hold the data used in this tutorial. Enable the Cloud Dataproc, Compute Engine, Cloud Storage, and BigQuery APIs. Creating a Cloud Storage bucket in your project to hold the data used in this tutorial. Install the Presto client software on your local machine. Download the presto-cli-nnn-executable.jar to your local machine, rename it to presto-cli, and make it executable. Optional ComponentsBeta Update: You can now ask Cloud Dataproc to install Presto on your cluster without using an initialization action (see Optional Components→Presto). To do this, change the gcloud dataproc clusters create command, below, to gcloud beta dataproc clusters create, and replace the --initialization-actions flag with --optional-components=PRESTO and --image-version=1.3-deb9 flags. If using the optional component, the Presto server will run on port 8060. Create a cluster by running the commands shown in this section from a terminal window on your local machine. 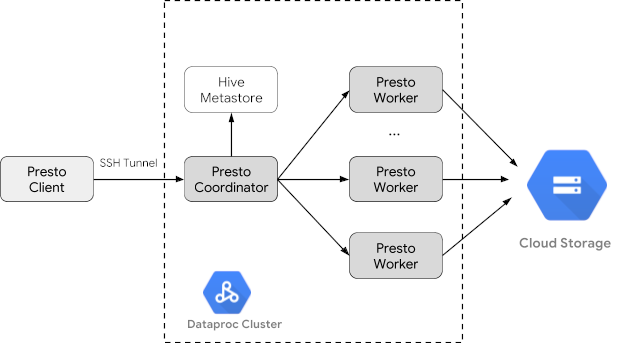 Create a Cloud Dataproc cluster using an initialization action to install the Presto service software on the cluster. REGION: region where the cluster used in this tutorial will be created, for example, "us-west1"
ZONE: zone within the cluster's region where the cluster used in this tutorial will be located, for example, "us-west1-a"
Create a cluster using the default or a custom initialization script. Set a local INIT_ACTION variable to point to the location of the initialization script in Cloud Storage that will install the Presto service on a new Cloud Dataproc cluster. Run the gcloud command-line tool on your local machine to create the cluster. The Presto initialization action, which is co-located in the GitHub dataproc-initialization-actions repository, installs Presto at on your cluster's master node at /presto-server-version. Creating a High-Availability cluster – a cluster with multiple master nodes – is not recommended since the coordinator is started on master node 0, and any other other master nodes will remain idle. Copy the Presto initialization action from Cloud Storage to your local machine. Modify the initialization script to customize the Presto configuration. Upload the custom Presto initialization action from your local machine to the Cloud Storage bucket you created in Before you begin. Creating a High-Availability cluster – a cluster with multiple master nodes – is not recommended since the coordinator is started on master node 0, and other master nodes will remain idle. To monitor or troubleshoot the Presto installation on your cluster, SSH into cluster VMs, then view the initialization actions logs. If an error is reported that indicates the initialization action failed, for example due to a timeout error, delete the cluster and re-run the gcloud dataproc clusters create command to re-run the initialization script on a new cluster. Export the bigquery-public-data chicago_taxi_trips dataset to Cloud Storage as CSV files, then create a Hive external table to reference the data. On your local machine, run the following command to import the taxi data from BigQuery as CSV files without headers into the Cloud Storage bucket you created in Before you begin. Create Hive external tables that are backed by the CSV and Parquet files in your Cloud Storage bucket. Create the Hive external table chicago_taxi_trips_csv. Verify the creation of the Hive external table. Skip this step to save time and resource usage. If your cluster has 3 or fewer nodes, this query can take several minutes. You can skip this query step and only verify the creation of the final Hive Parquet, below, since that query step is significantly faster. --execute "SELECT COUNT(*) FROM chicago_taxi_trips_csv;"
Create another Hive external table chicago_taxi_trips_parquet with the same columns, but with data stored in Parquetformat for better query performance. Load the data from the Hive CSV table into the Hive Parquet table. Verify that the data loaded correctly. --execute "SELECT COUNT(*) FROM chicago_taxi_trips_parquet;"
You can run queries locally from the Presto CLI or from an application. This section demonstrates how to query the Hive Parquet taxi dataset using the Presto CLI. Run the commands in this section on your local machine. 1. Create an SSH tunnel. Run the following command to use dynamic port forwarding to create a localhost:1080 SOCKS proxy on your local machine that connects through an SSH tunnel to the master node of the Cloud Dataproc cluster. The terminal will hang during the execution of the command. 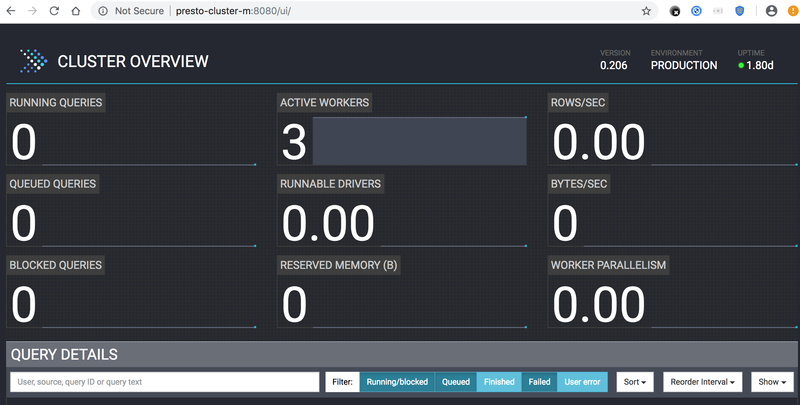 In a new terminal window on your local machine, run the Presto CLI and connect to the Presto server running on port 8080 of the master node of the cluster. At the presto:default> prompt, verify that Presto can find the Hive tables. Run queries from the presto:default> prompt, and compare the performance of querying Parquet versus CSV data. Download the Presto Java JDBC driver. Add a presto-jdbc dependency in Maven pom.xml. By default, the Presto initialization action configures /var/presto/data as the Presto data directory on the cluster's master and worker nodes. The Presto logs are located at /var/presto/data/var/log/. Create an SSH tunnel with SOCKS proxy from you local machine to master-node port 1080. Launch a Chrome browser with the socks5://localhost:1080 proxy. After you've finished the Use Presto with Cloud Dataproc tutorial, you can clean up the resources that you created on GCP so they won't take up quota and you won't be billed for them in the future. The following sections describe how to delete or turn off these resources.